Make DIY Slime by using Unicorn Rainbow Glitter & play in Slime Making Games. 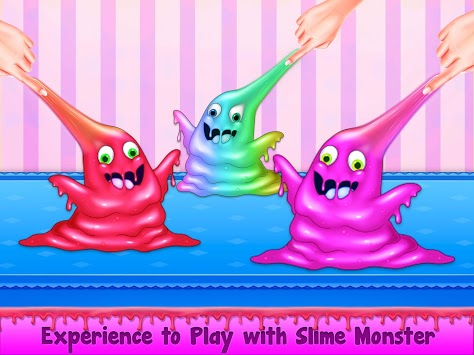 Play this Crazy Slime Maker Game of 2019 and have fun in Fluffy Slime Maker Game😊! Make the DIY Unicorn Slime in Cute Unicorn Slime Maker using different ingredients. Be the Craziest Rainbow Unicorn Slime Master and use your Squishy Jelly Toy Making skills for Cute Fluffy Jelly Toy Making. Shopping: Go to the mall for Shopping, buy all the required ingredient for DIY Slime Making and go to next scene. Slime Selection: Choose your favorite Cute Fluffy Slime from Glitter, Jelly Toy and Unicorn Slime. Start the Simple, Glitter, Rainbow and Rainbow Glitter Slime making. Slime Making & Playing: Take a bowl and add the glue, water, foam, flour and rainbow color in it. Steer the bowl for Unicorn Slime Making. After rainbow unicorn making, play with the beautiful Jelly Toy by stretching, squishing and finger stretching. Unicorn Scene: Add glue in different shapes, then rub and stretch. Slime Playing: Play with different texture with your partner. 	Make Best Crazy Slime and be the Crazy Fluffy Slime Maker. 	Perform well for scene unlocking. 	Highly HD graphics with Interactive Background sounds. 	Smooth and stunning User play control.